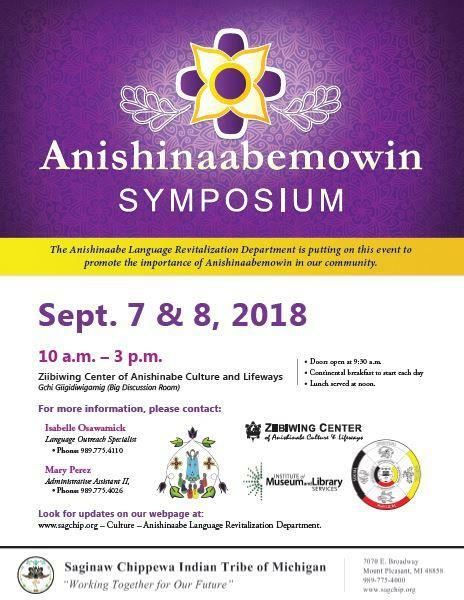 The Anishinaabe Language Revitalization Department is putting on this event to promote the importance of Anishinaabemowin in our community. Please call either Isabelle Osawamick or Mary Perez of those who want to attend as we will be checking you in upon arrival. You may also email Mary Perez at maperez@sagchip.org with the names as well. Harvey Trudeau is an Ojibway Elder from Northern Ontario, Canada. He was the former Chief of the Sagamok First Nation for six years. Currently he is the Chairperson of the Sagamok Elders Council of Sagamok Anishnawbek. He has been involved with many issues concerning Indigenous people and being that advocated at the National, Regional and Local government levels. He is a fluent speaker, as Anishinaabemowin is his first language. He is a practitioner of our Traditions and Cultural ceremonies. Beside him is his wife, Delores Trudeau who is a retired teacher and fluent speaker of Anishinaabemowin as well. They have been involved with the revival of Anishinaabemowin for many years and have been active board members of the Anishinaabemowin Teg Organization (Where the Language Is) for twenty-five years. Gerard Sagassige is a registered member of Curve Lake First Nation. He is of Mississauga Nation and a proud elder of sharing Anishinaabemowin across Canada and the United States. He has started several cultural language camps throughout Indigenous communities and is a spiritual advocate for well over 30 years. He participates as a facilitator in many Anishinaabemowin workshops to revitalize Anishinaabemowin Language. • Doors open at 9:30 a.m.
• Lunch served at noon. www.sagchip.org – Culture – Anishinaabe Language Revitalization Department.